“Drive cautiously”… this winter it will again be a frequently heard message in traffic information, unless if it were up to me. Don’t we have to take into account circumstances like iciness anymore when we’re on the road? Is this an invitation to recklessly do whatever we want? No, it isn’t. It’s all about the message that is given with ‘cautiously’, and to be more precise: it’s about the mindset underneath ‘cautious’. When we used to take off for school on our bikes, the last words we heard when we left were: “Be nice, learn well ánd be cautious!”. Being a teen-ager before heading for the riding stables: “Be cautious!”. Every time we stepped into the car: “Drive cautiously!”. I never reflected upon it, it belonged to a range of rituals of our very motherly mother. What I probably heard most in these messages was the underlying love that created these rituals. Until working with horses made me aware of the actual message underneath ‘cautious’. I’m never cautious anymore. And I advise everyone not to be it either. It’s about what the message ‘cautious’ puts attention on. In the ritual messages mentioned above, ‘cautiously’ meant ‘Make sure nothing bad will happen to you’: make sure you don’t have an accident, make sure you won’t fall, make sure you won’t get bitten nor kicked. First of all, ‘be cautious’ invites to avoid something, out of fear, which turns it into anything but a solution focused message. What exactly do you have to do to avoid an accident? To avoid falling? To avoid getting bitten or kicked? Next to that, nature doesn’t understand ‘not’: if you don’t want something, you actually put much attention to it (Don’t think about a rabbit… What is the first thing that pops up in your mind?). And last but not least: fear puts noise on reality out of assumptions and interpretations. The message “Be cautious!” I heard when I took off to the riding stables, originated out of fear that horses bite, kick and bolt whenever they are frightened. The more I got caught up in horses’ natural behaviour, the more those assumptions were refuted. 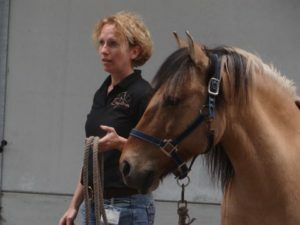 Before a horse actually bites or kicks, it will give first subtle and then clear signals, unless there’s trauma in the behaviour. And bolting? Horses take good care of their energy. Being flight animals, they can’t afford to waste energy. Horses do what is needed, when it’s needed, in the volume that is needed. A horse in balance will check whether fleeing is necessary. If it is: run! If not: stay. Looking at nature I can’t find any examples of ‘cautious’: a monkey doesn’t jump through a tree cautiously. 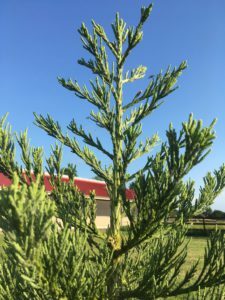 That would mean that he would direct his attention to avoiding those branches that aren’t strong enough, or that are too far apart from each other. In nature I also don’t find many examples of reckless behaviour, being the opposite of cautious. After all, “Whatever’ is not a mindset that helps to survive in nature. Animals’ natural state of being is alertness: their radar is constantly turned on, their attention 360°. Not out of ‘making sure nothing bad will happen’, but out of ‘paying attention to be able to do what is needed’. This is not caution, nor recklessness: this is thoroughness. Thoroughness is a mindset that really makes a difference. It starts from observation instead of from fear, it makes you look at opportunities and invites to undertake constructive action. A monkey jumping through a tree looks for branches that are strong enough and estimates what distances he can cover. A monkey jumping through a tree will do that thoroughly. Not only is “Be cautious” a message that – however well-meant – is given out of fear, it also invites towards fear, towards directing attention to potential danger. Is there a thorough alternative? Yes, there is. The message “Keep it safe”, for example. “Drive safely” directs attention to what to do instead of to what to avoid. If it were up to me, from now on “Drive safely” will be the message that is to be given in traffic reports. If it were up to me, from now on everyone will act thoroughly instead of recklessly or cautiously, also in communication. After all, also in communication we are too often reckless or cautious, causing messages to become respectively aggressive or invisible. Only thorough communication leads to unencumbered assertiveness. An example of cautious communication is “It would be nice if you might try it”. The actual message is wrapped up a lot, possibly out of insecurity or to avoid snubbing the other. The reason actually doesn’t matter, the result is that the real message is not clear: what exactly does the one who gives this message want? A recklessly given message could be: “Just do this”. This is a message which is thrown to the other rather than communicated. Especially through using ‘just’: the one who gives this message apparently assumes that the other of course has the same perspective as he has. What could be a thorough version of this message? “This mailing has to be sent today before 4pm, my question to you is to do this. What do you need in order to get this done?”. Fact, expectation, check: these are some basic ingredients of thorough communication. Aggressive and cautious communication are reactive and I-oriented, thorough communication is unencumbered and leads towards genuine inter-action. “Be cautious”… My mother is the only one who still can say this to me, out of nostalgia for the loving rituals. Even she doesn’t do this anymore, though. “Drive safely” is what she tells me with a kiss on my forehead every time I get back into the car. It is a new ritual, as loving as the old one, and with a much more constructive message. Next step: the traffic reports… To be continued! This is a blog about how damned bewildering knowing what you want can be. And about how you can choose to turn ‘must’s’ into options. Some time ago, my youngest brother and I were updating the website, to be more specific: we were editing the description of our five day programme on Unencumbered Communication. The original description said that the first two days of this programme (about Attention and about Direction) are about ‘What do I want?’ and the three next days (about Power, about Thoroughness and about Assertiveness) are about ‘And do I really mean it?’. I read it, and all of a sudden something didn’t sound right anymore. Basically it is not about knowing what you want, it’s about actually making choices! We are in the midst of the summer holidays. What I want to do during these holidays? I want to visit the 7th century monastery on the Irish island of Skellig Michael, I want to look for the alleged pyramid of the sun near Visoko in Bosnia, I want to go horseback riding in the Khan Khentii mountains in Mongolia, I want to go to the Sequoia National Park in California to see the giant sequoia General Sherman, I want to do panda bear spotting in the Wolong National Park in China, I want to go to Liguria in Italy to visit a dear friend, I want to go back to the Greek Island of Karpathos where I worked with the powerful stallion Poupito, I want to go to Mount Kailash in Tibet, I want to enjoy pleasant walks in the Belgian Ardennes, I want to have a drink and a good conversation on a café terrace in Ghent, I want to spend quality time with my horses, I want to paint the frames of my windows, I want to write about how I combine Solution Focus and working with horses. There are so many things I want to do! Yes, it is important to know what you want. You can drown in it though, if you don’t make choices. Not making choices is like continuously driving on a roundabout. Over and over again you pass by the same options and every time you pass by, you may even see even more. All of these options are things you’d like to do, things that may bring something about, things that have been on your wish list for a long time, things that would make you happy. Partially, these things make you dream, and partially they push you into chaos: what can you do with such an abundance of options? Everything has its consequences: should you keep on driving on a roundabout, you would just be emptying your fuel tank. After all, I’ve never seen any fuel station in the middle of a roundabout. The only way to get off a roundabout is by choosing a turning and hence finding out whether or not you can do something with this option. If yes, you keep on driving; if no, you choose another option. And you can choose only one option at a time. That’s the difficult part: we often have the feeling that we are closing a lot of doors by choosing for something. We see choices as ‘must’s’, often prompted by fear. Such choices aren’t genuine choices, since in the background there is this little voice: ‘Suppose this is a wrong choice?’… Horses don’t live in indeciveness, nor in right or wrong choices. They go, they do, and everything that comes from that is information they will subsequently do something with. It is what it is, and what you make out of it. Horses show me that wrong choices don’t exist. There are choices, and consequences of choices. What I’ve learnt from horses is that making choices is an act of exploration, and that exploring things is a way of finding possibilities. Options. Out of ‘must’s’ we’ll often question our choices. ‘Was it the right choice indeed?’. Basically, there are only two answers to that question: either yes or no. Both answers can bring about a lot of burden: a yes might make someone stick to a choice for reasons of principle; a no leads towards doubt, to dropping the choice, thus getting back on the roundabout. Out of an exploration of options we can ask ourselves – open – questions about choices instead of questioning our choices. Questions like: what difference will this choice make? For me? For others? This exploration helps to – at least in this moment – genuinely say yes to a choice. Everything that comes forth out of this choice, is information you can subsequently do something with, turning choosing into a never ending exploration journey that will always bring you somewhere. In Ireland, in Bosnia, in Mongolia, in California, in China, in Italy, in Greece, in Tibet, in the Belgian Ardennes, in Ghent or at home with my horses. Or anywhere else. Every choice is all right. Out of my former enumeration of things I want to do during the summer holidays I’ve made a choice. You are reading a consequence of that choice right now. Other consequences of that choice are that my windows and my horses have to wait, just like the café terrace in Ghent, the hike in the Belgian Ardennes and all the other things I also want. After all, I can make only one choice at a time, and that is all right. By choosing to write this blog I’ve started a new journey, I’m curious to find out what options this will bring. “Not so close! This is such an annoying animal, really tiresome! Here Wim, you can take him. He seemed to be a cute pony, but he is way too pushy.” Wim takes over the lead rope from Els. He lets Djohar – the little four legged tyrant – smell his hand, calmly looks around, gives Djohar a matey look and starts to walk self-assuredly. Djohar sighs, relaxes and starts walking with him. Head low, licking and chewing, at more than one meter distance from Wim. At the same moment they come to a standstill, at the same moment they start to run at full speed, at the same moment they become quiet again. Els is watching them, amazed, and laconically says: “So, apparently it was not the horse’s fault… That’s a painful insight.” “And also a chance…”, I add. These are key moments. I take Els along the five core elements that I’ve learnt from the horses in the last couple of years. They have become the cornerstones on which my organization Equoia is built: Els becomes aware of the power of attention, of the importance of direction, of the difference between power and force, of the distinction between thorough en cautious, of the meaning of authentic assertiveness. This is only one story. Meanwhile, I have many stories to tell, and every time again they touch me. Horses bring about a lot, and they help you to give direction to it. That is where I step in. I observe and give ‘subtitles’ to what I see that is happening in the interaction between human and horse. In doing this, my starting point is that horses must be given the chance to stay who they are in working with people. I am not going to correct them in their behaviour, since their behaviour in a moment tells something about the interaction in that moment. I am not going to unlearn Djohar’s pushy behaviour. He would be easier to walk with if he wasn’t that obtrusive, it’s only: I don’t want ‘easy’, ‘good’ horses. I want horses to be their authentic selves and hence invite people to do the same. And, very important: ‘becoming meaningful’ is not about winning or losing. It’s about who takes the initiative, about who provides the most powerful invitation out of true togetherness. Thát is the one who – in that moment – becomes meaningful. The language of the subtitling I give is Unencumbered Communication. Underneath the load of emotions, judgements and stories, everything is information, coloured by the pair of glasses you are looking through, realizing that the pair of glasses somebody else is looking through, is different from yours. Not better, not worse. Different. I’m not ‘using’ my horses in individual coachings and team coachings. I don’t expect them to take up a role. There’s no experimenting with what doesn’t feel all right, nor with what someone does not want anymore. So, no ‘Look at the difference in reactions of the horse between when you chase him away or when you are clear about your own personal space, in an unencumbered way’. Actually, for a horse ‘pretending’ doesn’t exist. For a horse, everything is for real. If you chase him away to find out how he will react, it is no experiment. For a horse, everything is a real experience. And I want that to be dealt with thoroughly in everything I do with my organization Equoia: my horses are no perk in the individual coachings and the team coachings, they are full-fledged authentic partners. Themes that are often dealt with in individual coachings are assertiveness (dare to dare, in a constructive way), clear communication (is what you say also what you mean?)) , gaining visibility (because I’m worth it! ), powerfully inviting out of an authentic togetherness (I contribute). In team coachings we often work around ‘Purpose’ (what is our joint direction?) and roles (what can I expect from you? And you from me? How can I create ownership? And what is needed to really take up ownership?) . In all team coachings we work towards a more dynamic balance within the ‘herd’ (the team). “Who would have thought that walking around with a horse could create such a stir? !”… I am grateful for the fact that it keeps on amazing people and I’m glad to contribute to that, together with my horses. 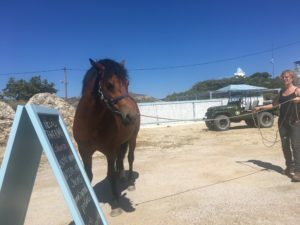 This isn’t a story about working with a horse on the idyllic Greek island of Karpathos where I am in the context of the yearly Solution Focus Summer Retreat. This is the report of working with a young stallion as an illustration of the power of unencumbered communication. 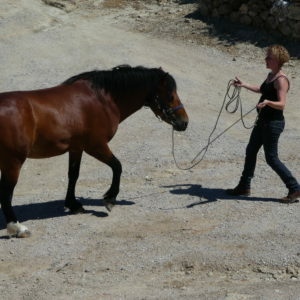 I meet the five year old stallion Poupito on a parking lot in a little harbour on Karpathos. For three years, Poupito has been with this owner who bought him out of love at first sight. The horse stands tied to the wall, wearing a halter with a bit. “Necessary”, his owner says, “Without a bit he runs off: he’s a very independent horse”. There isn’t much space for making contact, not in place – because we’re standing between a lot of parked cars, nor in time. I bring my hand towards Poupito’s nose. What I get in return is pushy snapping instead of open curiosity. Personal space will be an issue. I’m attracted to the young horse: his steadiness there on this crowded parking lot, the sparkle in his eyes, his apparent obstinacy. I’m both curious ánd excited. Working with an unknown young stallion on a place that is unknown to him in circumstances that are totally different from what I’m familiar with: from a mere rational point of view that is not the smartest thing to do. Gut feeling and curiosity make me step into this adventure, though. At three o’clock sharp, the owner arrives with the trailer at the open space in front of the terrace of the Taverna. Poupito is taken out of the trailer. 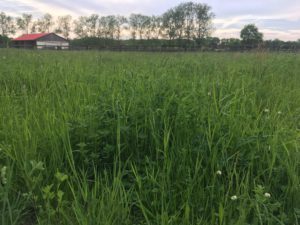 I cannot create a fenced piece of land to work with him running free. In order to be able to work with enough space for both of us after all, I asked the owner to bring a strong rope of about six metres of length to lead Poupito with. The owner has brought it. Poupito indeed appears to be independent. Self-assuredly he walks through the new environment. To him I am just a part of that environment, something at the other side of the rope. I will have to apply leadership skills in a clear and unencumbered way in order to get a ‘yes’ from him. This is a challenge, since in the first moments I obviously do not exist for him. He takes the initiative, and he tolerates my presence. Always important and in these circumstances I’m being extra thorough in this: I make sure I have a clear intention. What I want is applying what is needed to become meaningful to Poupito in this moment. How to get there, starts with having my attention 360° and being clear in indicating my personal space. In order to get the conversation with Poupito going, I need him to direct some of his attention towards me. At first I do this by covering his attention with mine. I start working with his attention, not with his body. Working with a horse’s body in which no one is ’present’, leads to nothing after all. It would be like talking to a phone which the person on the other side has left behind for a while to water the plants. I open all of my senses and see myself as the centre point of a radar. This way I scan the broad environment, 360° around me. Sometimes I stand, sometimes I walk. Gradually Poupito becomes interested in me. He regularly starts turning one of his ears towards me, every now and then he looks at me and more and more often he then actually comes to me. Initially he almost rumbles over me. Being a stallion, this young man has been kept alone for years. He hasn’t learnt and doesn’t learn from other horses how to deal with each other’s personal space. With Poupito, this results in quite intrusive behaviour. Personal space is essential: it is the space that enables you to take care of yourself and of the other. Obviously, Poupito is not used to having a conversation about this. A high volume of unencumbered clarity is needed to create some tuning. To even create just an opening towards some tuning. Thoroughness is required: should I react on this pushy behaviour and should I try to get him under control, I risk to evoke a battle I don’t want to fight because of two reasons: in front of me there’s about six hundred kilos of horse, and I want to become meaningful to him. Getting into a fight with six hundred kilos of horse I would definitely lose, risking ‘becoming meaningful’ to be literally kicked down. The challenge to react on his behaviour is huge. Whenever I do not direct enough attention to him, for example because the to me unfamiliar rope twists, he makes a charge by intruding my personal space and snapping in a dominant way. My answer is clarity, not punishment. I do not punish him for what he did, I am clear in what I want our cooperation to be like, now and in the future. And with being clear I mean unmistakably clear, in an unencumbered way. In that mode we walk, in that mode we stand, and he’s getting more and more curious. He’s now becoming really interested and we step into the phase of exploring what we have to offer each other. It is like tango dancing, and he keeps on being on the boundary of saying yes or walking over me. It’s going to be a project to have this self-assertive adolescent into really experiencing that cooperation doesn’t make him less, but more. That he doesn’t have to make himself smaller. That he is invited to interact instead of challenged to react. That it is and will be all right to be critical about what is offered to him and asked from him. That the quest for what is needed in each cooperation is an invitation to grow, together as well as individually. It’s not about getting where I want to get with him. It’s all about having a clear intention and finding out how to then get to tuning. Real togetherness is not a hundred percent that has to be divided equally or less equally over the partners (in whatever context). Real togetherness originates when partners (in whatever context) grant themselves and each other their own one hundred percent, thus enabling each partner to grow in togetherness, not faint. And Poupito? That will be a process. 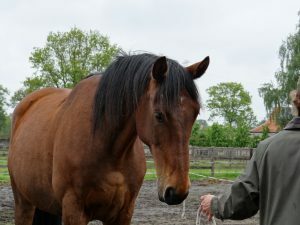 His owner realizes that in this moment he faces two large pitfalls: the one of comradeship with his horse and hence not offering enough clarity, and the one of controlling and hence often getting into a struggle. When I returned Poupito to his owner at the end of the session, the owner started to play amicably with Poupito’s nose and lips, on which the horse pushed hi m aside. The owner reprimanded Poupito for this and the horse reared. Both logical ánd unfortunate behaviour. Of both. By not offering clarity you do not position yourself as a leader. You are not meaningful. When the horse fills the gap in clarity and is then reprimanded for that by the same person that was before – not knowingly – showing in his behaviour that he was not taking up leadership in that moment, thus being unable to take care for safety, it simply is confusing. Not more, not less. Poupito’s owner is a loving man who clearly sees where he is in the process with his horse. He wants to give this project the attention, the energy and the time that is needed. He invited me to come over twice a year to guide him with Poupito. ‘The next morning, Sid got up a little anxious. He sat close to the piece of land he had cultivated and waited. Hours passed and nothing happened. The day passed and still nothing happened. “All right, at least I’ve been living spiritedly during these days in the Enchanted Forest. I did what seemed good and necessary to me”. It had appeared to be really hard to decide on the right spot on which the four-leaf clover, the clover of infinite happiness, could come up. But then, all of a sudden, something happened unexpectedly. The wind, the Lord of Destination and Coincidence, he who seems to be moving randomly, started moving the leaves of the trees. And then it started to rain seeds, tiny green-golden grains. Those were the seeds of the four-leaf clover, every seed being… a potential clover of happiness! There was more than one… it really rained seeds of four-leaf clover. The most incredible thing was that they did not only fall on the spot where Sid was, they fell everywhere in the Enchanted Forest, in all corners and holes of the forest. And not only in the Enchanted Forest, but everywhere in the whole kingdom. It rained seeds of four-leaf clover above the heads of the knights who hadn’t responded to Merlin’s challenge; it rained above all beings in the forest, above the Gnome, above the Sequoia, above the Dame of the Lake, above Ston…; above Nott and above Morgana. It rained seeds of four-leaf clover… everywhere! After some minutes, the rain of four-leave clover seeds stopped. The tiny green-golden grains merged with the ground, like drops of water in an ocean, in all the corners of the Kingdom. They just disappeared like seeds scattered in the desert. And so they were lost, since they did not sprout. Billions and billions died on the worn out, rough and stony ground of a dark forest. I admit, I had lost it for a while. What is it, happiness? Being happy? I haven’t found an answer and to be honest, I stopped thinking about it. I’ve learnt to have long term intentions, not as a goal but as a destination, as in a GPS. I’ve also learnt to build towards it step by step, enjoying the process. My basic intention? 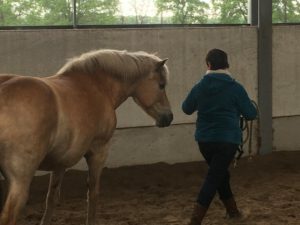 With Equoia, I want to contribute: help people and organizations experience and use their core power, with the support of the horses and what they teach me. How? In my mind, I constantly hear the words of my mentor, Pieter Baalbergen. For a couple of years, I had the opportunity to immerse in the richness of his wisdom and his lived experience concerning the nature of horses: who are they, and what do they fundamentally need. He always used to say: “If you want to reach a result, don’t head for the result. Instead, create the conditions that enable the result to arise”. Completely analogous to the message of the booklet mentioned above. With Equoia, I will carefully keep on cultivating land into fertile soil for happiness. At this very moment, my youngest brother is probably giving an amused wink, thinking “Here we go again…”. We have gorgeous brother-sister conversations about this topic. According to my brother it exists, according to me it doesn’t. Coincidence or not, very often things just come together. To me, these things are small signposts that lead to unimaginable ‘coincidences’. In English there’s a word for it: serendipity. One such occurrence brings me to writing this blog. During Summer 2016, I gave a workshop on the Solution Focus Summer Retreat in Szigetmonostor, Hungary. I wanted to share the essence of what I do with my organization Equoia. Reactions were overwhelming. Natalie, one of the Hungarian participants, took me by the shoulders on the last day of the Retreat, looked me straight into the eyes and said: “Wendy, this was fantastic. You must promise me to never stop spreading this!”. In February 2017, Natalie sends me a mail. She has been asked to give a workshop on the conference of the International Coach Federation in Budapest, and she wants to do this with me. Whether I was in for the idea? 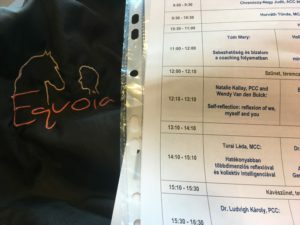 For a minute I’m in doubt: the conference takes place in the week before I’ve planned the 3rd Guided Tour of Equoia on my own location. This event requires a lot of preparation, that’s why I had wanted to keep the week before free. On the other hand, I really liked the idea of giving this workshop together. I said yes, under the condition that it would take me only one day. A week later my plane tickets are booked and we’ve skyped to set the main frame for the workshop. It feels like we’ve been working together for years. Two days before the conference I print the plane tickets and I notice that my name is misspelled. I call the airline company. “This probably shouldn’t cause any trouble, mrs”. I choose for the safe side and have the mistake corrected. Nothing wil stop me from going to Budapest! The day before the conference, both enthusiasm and adrenaline take over. I feel like a little child on the evening before Christmas. An hour before going to bed, my adrenaline level even increases when Natalie and I have a last skype conversation in which we last minute alter the concept of the workshop again. May 17th. Petra, a good friend of mine, is so nice (ánd so crazy) to call me at 4 a.m. to ensure that I get out of my bed in time. When she calls me, I am already outside, feeding my horses. I take a shower, get ready and at 4.45 a.m. I take off to Brussels South Airport. 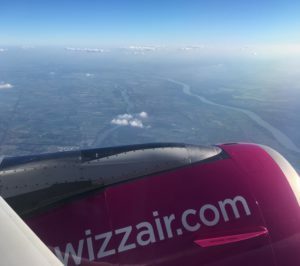 Ten minutes earlier than foreseen I land in Budapest, another ten minutes later I am in a taxi to give Natalie a big hug about half an hour before the start of our workshop. Meeting a soulmate! Our worksh op (“Self Reflection: Reflexion of me, myself and you”) goes as if we’ve been working together for years. Our last minute preparations on skype and the ones I did on the plane this morning remain untouched. 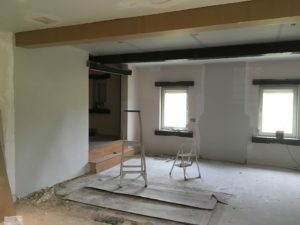 Faithful to the message we want to bring, we give direction to what pops up, thus creating a workshop that differs again from what we had in mind: a masterly example of “Be prepared, then go with the flow!”. Reactions are flabbergasting. I am touched by so much acknowledgement. During lunch, we chat up while now and then people come to us to congratulate us with our workshop, amongst them the chairwoman of ICF Hungary. After lunch, I follow another workshop together with Natalie, in Hungarian. Natalie translates the background info in English, then there’s an experiment. A coaching exercise is planned, in groups of three: a coach, a coachee, an observer. 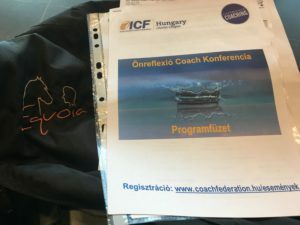 I take up the role of observer and ask both others to do the coaching in Hungarian. John Brooker inspired me for this experiment: last Summer in Szigetmonostor, he talked about a Solution Focus coaching during which coach and coachee spoke another language and they didn’t understand each other’s language. The questions of the coach were translated for the coachee, the answers of the coachee were not translated for the coach. 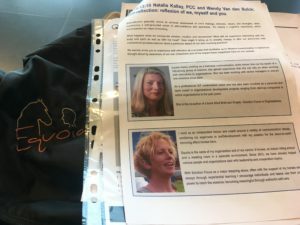 Still, it became a successful coaching, thanks to the power of solution focused questions and the information that came from nonverbal communication. And so I was observing a coaching of which I didn’t understand one single word. 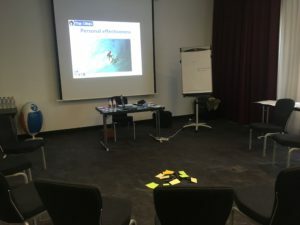 After the coaching, I shared what I had noticed about the process between coach and coachee, and this remarkably matched with what both Hungarian colleagues had experienced in the process of their coaching session. Extraordinary!